The Keymand iPad app connects to a Mac, and acts like a beefy, user-configurable MacBook Pro Touch Bar. Plug your iPad into your iMac, iMac Pro or MacBook and Keymand 1.1 will give you one-touch buttons to control your applications or the computer itself. 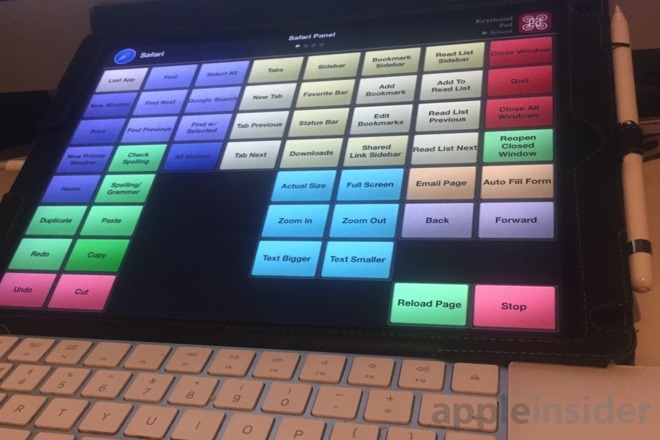 The iPad screen becomes a sea of buttons which come with typical functions and can be edited or added to as you need. Keymand's aim is the same as Apple's for the Touch Bar on MacBooks, just on a larger scale. Rather than having to dig through menus to find an option or feature you use a lot, you just make a button for it. So, while you're working at your Mac, you can reach over to your iPad and tap one of those buttons. It does require you to be running a free Mac app called Keymand DT. When you've installed that, a Lightning connection means you won't get any WiFi or Bluetooth delays. That same Lightning cable connection also means that Keymand knows what application you're using on the Mac. Launch Safari and Keymand will present you with a series of buttons to deal with common tasks like New Window, Add Bookmark and so on. If you use any standard Apple app provided on your Mac then Keymand comes preloaded with a screenful of relevant buttons. When you're in Safari, for instance, Keymand shows you around 50 different buttons. It's about the same in iTunes and Mail, but Apple Notes has around 40 and the App Store has 11. So, right away, the most commonly used tools in the most commonly used apps have buttons preset on Keymand. However, Keymand has space for more. You can create buttons for any application you want. Then, not only can you add so many new buttons that you fill up the iPad screen but you can then swipe to get another three screens. 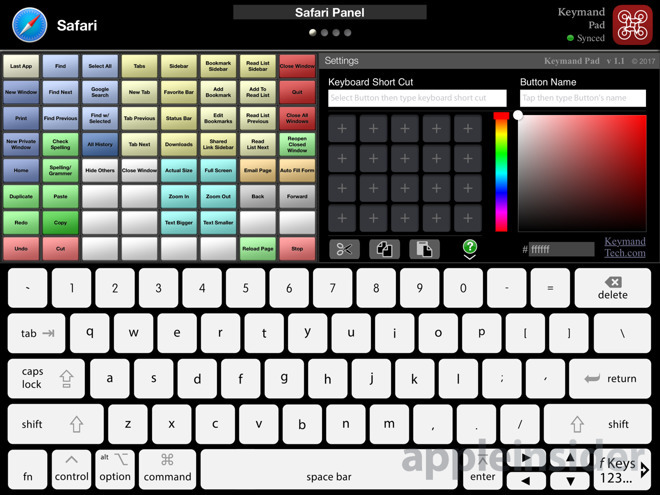 Each has a maximum of 64 buttons so Keymand really offers up to 256 buttons for every app you ever use. There's no question but that if there's an option you use a lot in any macOS app then you can make a button out of it and be able to tap your iPad to make that happen. Editing the buttons is mostly very easy, too. On your Mac, you go into whatever app you want to make a button for and then on the iPad you tap the Keymand logo to go into an editing screen. 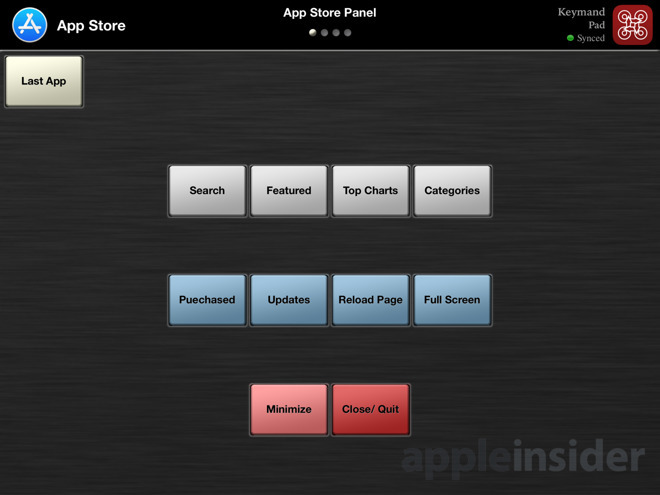 Tap next on a button that you want to change or to set up from scratch. You then give that button a name and, if you want, pick a color. So maybe you could make 'Quit' be one button but you color it red while New Document is green. Then you tell Keymand what command it is that you want to add to the button and you do this by typing in that command's keyboard shortcut. If the feature you want to execute at a touch through Keymand does not have a keyboard shortcut, Keymand can't do it. However, macOS lets you assign keystrokes to any menu option through the Keyboard preferences pane. Entering those keystrokes into Keymand is a little fiddly, though. For some reason the section where you type the keys into dims rather than highlights when you're editing. Plus you get a full keyboard on screen but if you make a mistake and tap delete, for instance, then Keymand thinks you're telling it you want 'delete' to be a keyboard shortcut. Equally, if you finish entering your keyboard shortcut and press Return, then Keymand thinks you want to make 'Return' be the keystroke on the button. So entering the right keyboard shortcut means both finding what it should be through looking in the macOS app's menus and then entering it carefully into Keymand. It's something that you only ever need to do once per button you set up. Once you've done it, being able to tap to launch Find in Mail or insert a new row in Excel is genuinely fast and useful. It also works when the keyboard shortcut is not a standard one that needs you to press the Command or Option keys. Keymand will send your Mac any keystroke you tell it, so if you wanted to put, say, the letters of the alphabet on its buttons, you could. You also might want to use audio soundboard app Farrago and assign letters to different sounds. So, you could tell Keymand to send an "A" which tells Farrago to play whatever sound you've set up under that letter. The app does hinge on keyboard shortcuts, though. You're just making a button to enter the same keystroke you could from the keyboard. As fast as it is to tap a button on Keymand, it can be faster to keep your hands on the keyboard and type the shortcut yourself, assuming you don't have to hunt-and-peck for the combo. However, if you have an iPad by your Mac on your desk, it's a good use for that extra screen without a screen-extension app. Plus, the Lightning cable will be charging up the device all day too. Keymand 1.1 is on the iOS App Store for $19.99.